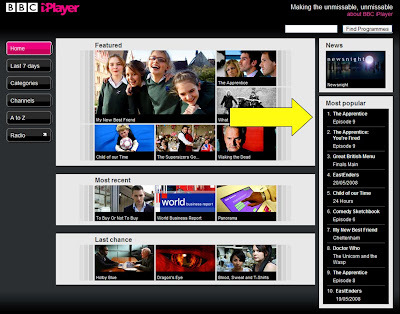 The Apprentice is the number one viewed on-demand show on the BBC's iPlayer service today. This is not surprising as a peak audience of 14.6 million viewers watched Manchester United's Champions League Final victory over Chelsea live on ITV1 last night - making it the most watched television moment of 2008 to date with ITV1 taking a 60 per cent share of viewers. Is it therefore not unreasonable for media outlets to exercise restraint the morning after must see TV like the Apprentice? Knowing what is going to happen before you get the chance to watch delayed TV via an on-demand player, greatly reduces the enjoyment of viewing and makes me wonder if watercooler TV can ever feature comfortably on on-demand services? When BBC news announce football results before their football highlights programme they announce 'if you don't want to know the results, look away now.' It would be nice if newspapers / radio / TV shows followed the same path the morning after the Apprentice is shown! "The hit BBC1 show lost 1.7 million TV viewers to the epic Champions League final last Wednesday, broadcast live on ITV1 and Sky Sports 1 with Manchester United beating Chelsea on penalties. Last Wednesday The Apprentice's viewing figures dropped to 5 million viewers on BBC1, compared with 6.7 million the previous week." Whilst the BBC don't publish iPlayer viewing figures by programme, the Guardian has learnt from PlusNet that on the night after the Champions League final the iPlayer gained record traffic - presumably from people catching with the Apprentice. UPDATE 2: The final episode of the Apprentice yielded the highest ever audience for an episode of the show. The viewing figures for the 2008 Apprentice final were an average of 8.9m (compared to 6.8m for the 2007 Apprentice final) with a peak of 10 million viewers tuning in to see Sir Alan Sugar name his next Apprentice.